How Digitising the Supply Chain Can Deliver Competitive Advantage for CMOs? Home How Digitising the Supply Chain Can Deliver Competitive Advantage for CMOs? Improving the performance of the Life Science supply chain is a focus for all, especially for pharma companies and Contract Manufacturing Organisations (CMOs), where a product not being delivered on time could mean life or death for the patient waiting on it. With two-thirds of pharmaceutical manufacturing now being outsourced, the Contract Outsource sector is growing at a rapid pace. Pharma companies are putting pressure on CMOs to deliver their products to market on time, manage issues and maintain the highest level of quality required in this highly regulated industry. The pharma industry is vulnerable to unforeseen occurrences. Frequently operating on a number of fronts simultaneously – investing in product development, launching into new markets and managing existing products. Outsourcing offers a means for companies to insulate themselves from these issues, shifting risk to the CMOs while giving full visibility of what they are managing and how. Now is the time to embrace Digital Supply Chain technology to gain a competitive advantage. While demand for CMOs is increasing, the success of the sector is also making it increasingly competitive. CMOs are under pressure to create a unique value proposition to pharma companies that will stand out from the crowd. Few CMOs have unlocked the potential of digital technologies to improve performance, however, those that have been are reporting a significant increase in productivity and client satisfaction. Beyond the challenges of the current economic climate, there are more fundamental challenges to be faced in terms of delivering a quality product on time, on budget and to a high standard. These Challenges can be overcome with the right technology being in place and would give any CMO the opportunity to stand out from their competitors. Perigord is a global leader, with over 20 years of experience in the provision of Artwork, Software Solutions, and Knowledge Process Outsourcing (KPO) to the Life Sciences Industry. Trusted by 15 of the top 20 Global pharma companies. Perigord Data has been working with a number of Global CMO companies, and have developed a solution to increase productivity and client satisfaction. 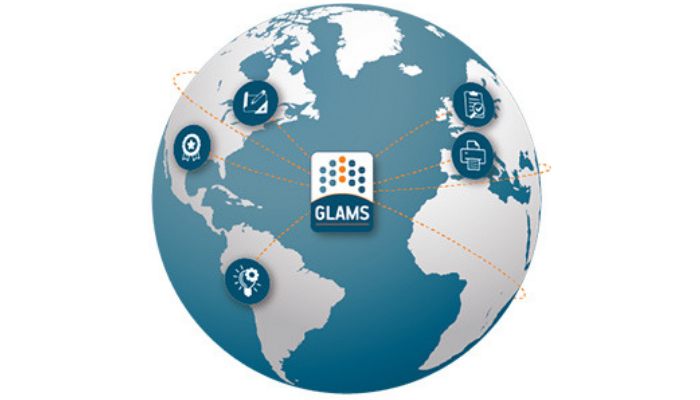 GLAMS™ is the world’s only dedicated workflow management system specifically designed for the life science industry. It is backbone of our product suite underpinning and delivering fully validated workflow and document management solutions for this highly regulated industry and is validated by the world’s leading pharma companies. Introducing GLAMS™ CMO, a purpose-built artwork workflow management platform for the CMO industry, which allows CMO’s to take on more clients and manage their end-to-end artwork process more efficiently. GLAMS™ CMO is a validated system that is easy to audit. It gives the Pharma client peace of mind, as it gives them visibility over their artwork process in a secure environment. Amidst tough competition, using a system like GLAMS™ CMO is an important differentiating factor and will grant a competitive edge to CMOs over other stakeholders in the industry. GLAMS™ CMO gives its users, and their pharma clients, the comfort of knowing that the fundamentals of both the packaging process and CMO business are controlled within a process driven system. Being able to enforce regulatory compliance and update existing processes without a breakdown in production can be a significant factor in reducing risk in the overall packaging process. GLAMS™ CMO is used in the highly regulated life science industry environment every day. GMP, Annex 11 and 21 CFR Part 11 compliant, and its extensive configuration capabilities allow users to stay on top of evolving regulatory requirements. For more than one GLAMS™ CMO user, the presence of a validated system has also been vital to attracting new business. Clients can be reassured that, by mapping a process to the AMS, whatever tasks must get done, will get done, when they are supposed to be done and will be fully traceable throughout the project lifecycle. Internally, using an AMS allows clients to be on-boarded quickly, following a clearly-defined process that ensures the new client can be brought online with the minimum of fuss. For CMOs looking to expand, an AMS allows for seamless scaling of a CMOs client base. GLAMS™ CMO employs a modular approach meaning you can add functionality, storage and workflows as needed. It also integrates with big pharma ERPs like SAP and Oracle. Providing users with the right information, at the right time in the right format is one of the basic requirements of any information system and an AMS is no different. GLAMS™ CMO eliminates the silos often associated with manual and paper-based systems ensuring that artwork-specific information, like meta-data, supporting documents, pharma codes, or approved PDFs, or the status of entire SKUs will be available to any user that needs it. GLAMS™ CMO provides full audit trails for every workflow, helping you to create detailed reports and track every job from beginning to end. In terms of quality and validation, GLAMS™ CMO has been developed to GAMP 5 guidelines and the Perigord team can handle any and all validation documentation required to ensure an effortless system implementation as well as continuous support throughout the platform’s life cycle. Essential to all parts of the pharmaceutical business is consistency. The use of an AMS is integral to ensuring this in the packaging sphere, allowing one, or many, processes to be mapped, managed and made replicable. Doing so eliminates any of the risk inherent in a human-managed process, preventing tasks from slipping through the cracks. Perigord can advise on process optimisation – identifying unnecessary tasks to be phased out or combined with others to improve overall responsiveness and reduce delivery times, all according to industry best practice. In GLAMS™ CMO, individual workflow stages can be assigned specific durations allowing easier timeline management and the generation of reports identifying pain points or bottlenecks. Not only does an AMS allow for consistency in process, but it also allows for consistency of data, acting as a single source of truth for any of the assets being tracked by the system. Pharma codes can be produced automatically and managed as individual assets giving full visibility of where they’re assigned and what products they’re associated at all times. In a world of cyber-attacks and information leaks, a secure environment is a basic requirement that CMOs need to provide for their clients. GLAMS™ CMO is a fully secure system which will hold information on artwork for each client and provide a full audit trail of everyone that has touched that it. GLAMS™ CMO user profiles are defined to allow users only have access to the system functionality and information they require. This means the information and artworks can be segregated depending on vendor or supplier, and the ability to see reports or the status of entire workflows can be limited to specific system users and controlled for the lifetime of their employment. The world’s political and economic situations have created an environment favourable to the growth of CMOs. The impact of the virtual pharma business model and conventional manufacturers’ constant drive to cut costs has made CMOs a vital part of the pharma value chain. CMOs need to embrace technologies in order to stay competitive whilst offering their pharma clients clarity and assurance of quality. Employing a workflow management system is the key to maximising this opportunity. GLAMS™ CMO allows users to manage their clients’ labelling and artwork processes efficiently, handling more artwork, in a validated, industry-dedicated system, with full reporting functionality that incorporates all your stakeholders.